Synnara is one of the main websites that Hanteo gets its information on sales from. It is also rumored to have a double effect on Music Bank chart. 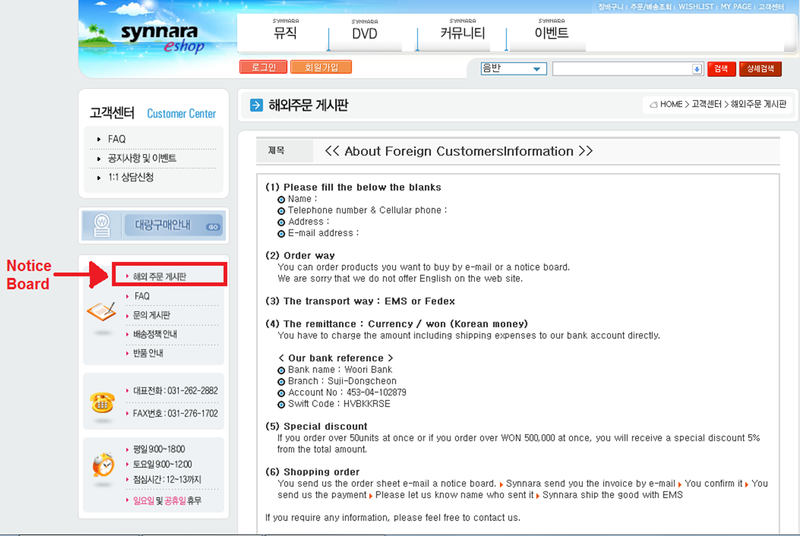 Unfortunately, foreigners cannot create an account on Synnara. 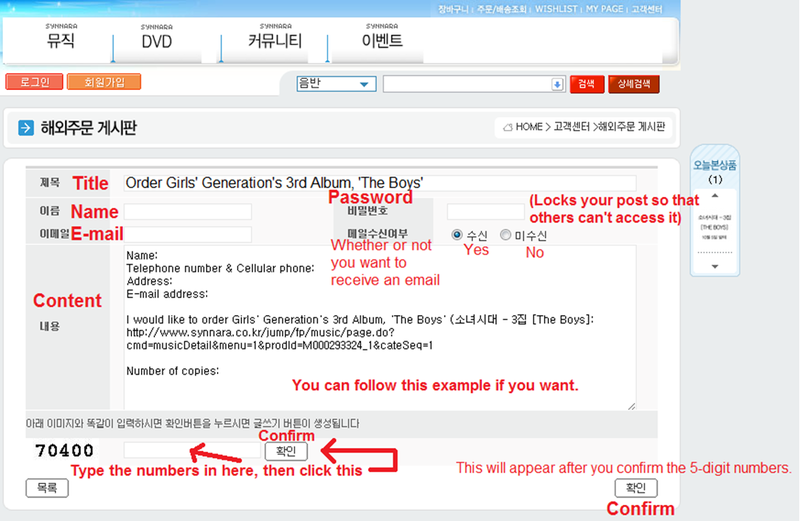 However, Synnara still offers a way for foreigners to order albums without signing in. Please read the information page. If you want to order by posting on the notice board, here’s how. 1. Go to the forum/notice board. 2. Create a new topic/post in the forum/notice board. 3. Type in your details. (You can follow how I’ve typed it) Click the button on the bottom-right corner to confirm. If you want to check back on your topic, just click your topic name in the forum/notice board and type your password in the box. The subject/contents of your e-mail can follow the topic/contents of the notice board post. Do you know which payment methods they prefer?? If you want to pay by other methods, I suggest you to e-mail them and inquire about it. hi, thanks for your explanation . well I’ve tried to contact them but they didn’t answer me. how I conform my payment by bank transfer? and how to now the shipping cost . Did you e-mail them your order form or post on the notice board? Synnara will get back to you by e-mail. They will send you the invoice of your order and all the details (total price of albums + shipping) should be on it. no,I just asked them about the shipping price . by e-mail. well ,i will send the an order email , and see what will be the cost . lol ehh I can’t really do anything if they don’t reply since I don’t work for them >__< I advise you to buy from other links (Here: http://sone.intothenewworld.net/main_e0.html if you wanna stand a chance to win an autographed album) I'll send in a fake order form and see what happens. can pls teach me how to reply to the admin from synnara?tq so much…. Can you screencap the page for me? tq so much for a quick reply..erm..i really don’t know what is screencap actually…but, i give u the link below, and after that u can see there’s a conversation between the admin and a person name seul ah, lee..the y keep replying for each other..so, how can i do that? Hi, thanks for the guide. I have a question regrading the price. On the item page its self, there’s 2 pricing, one higher and one lower. What are they about and which is to be followed? The price below is to be followed. where are you from? did they mail the album directly from your house? how did you pay? using won or ur currency? was it cheap? how much did it cost you for your shipping fee from korea to you? I’m from Singapore. They would definitely mail it directly to your house, like all other sites. I didn’t order from Synnara so I can’t answer your other questions. Do email them if you want to know more information. what is the working hours of synnara? Its easier to buy from their mini-shop in gmarket..
if u want to buy from their site… will have to wait… emailed them but only got reply after 2weeks..
Can we bank transfer them using our own currency? Like, i’m from singapore, can i bank transfer them with SGD? What should I do after the transfer payments? What are the methods of payment if I wish to order from them ? Thank you so much for posting this precious one. can anyone update this? the site doesnt look like that anymore………… the link posted redirects me to the main page instead.